Creating or Redesigning a website? Sometimes many people (including me now and then) over complicate things when starting to create or redesign websites. Most of us think about what we want our website to do for us, and that is only natural. While that may be natural, what we should be thinking about, is what our visitors (read: prospects and customers) want. I know it is hard for some to accept, but if you give your visitors what they want, they’ll turn into customers that will help you achieve your goals. Let’s talk about what your website visitors want in very simple terms. Can I easily find details about your products or services? How do I order or contact you? Think about your answers to those simple questions, and you will soon realize the answers are not as simple as the questions. Don’t let that discourage you. It is not that difficult, and it will surely be worth your time. Before you start answering the questions, think about who you want your visitors to be. Who are you trying to attract to your website? Write a small paragraph answer for each of the questions. Read it over and think about how your prospective visitor will search for a business or organization with products or services like yours. So, now you have some paragraphs of text, that may or may not look good to you. Don’t be frightened away. You have made a great first step. This is a good time to talk with a professional web design firm. I have nothing against a one-person shop. I was one for a short time fifteen years ago. There are a few great developers who “do it all.” The keywords are “few” and “great” for most geographical areas. Graphic design (specifically for the web), coding/programming, Search Engine Optimization aka SEO, and web presence marketing are, for the most part, very different elements of website development. Not many individuals are great at all of those elements. Okay, I’ll shamelessly suggest you talk to us at WebWise Design & Marketing. We’ll help you take what you written and develop a plan for your new website. Then, we’ll design your website with your potential visitors in mind. Our extremely talented graphics designers will create custom graphics. Our highly skilled coders and programmers, will create the pages, adding the functionality that your audience requires and deserves. We’ll keep you involved along they way. We’ll talk with you about using social media and tools that may be right for you and your audience. Your site may very well need a blog. You also might augment your online presence with a Facebook page, and/or a Twitter account. Of course, your website needs to be structured and coded properly so your information gets found readily on Google and other search engines. We’ll also talk with you about Google AdWords and other pay-per-click (PPC ) options, that will help you jump start a new or redesigned website. Those are only some of the services you get from a web design company that offers a full complement of services. Bottom line: Start thinking in simple terms, get some of those thoughts and questions on paper, and contact an experienced and talented web design company. Call us today at 1-800-281-9993 or 1-608-822-3750 or use our contact form. Well, the importance of great photos on your website got ratcheted up a notch. As I wrote in our last post, the new Search Options feature on the Google Search Engine Results Pages, aka SERPs has changed the way searchers will view results. “Sites with images” isn’t the only feature (actually, a search filter you may activate by clicking) that is easier to see and more likely to be seen, but it is extremely important. Since the “Sites with images” feature has the potential to impact many of our clients and a lot of other website owners, I believe it is worth closer look. For those of you who rely on photos to help sell your product (and if you don’t do that, you should), it is definitely time to pay more attention to photo quality. Google understands that searchers like visuals. That is why the have options for maps, videos, sites with images,wonder wheel and more. Believe me as more and more users discover the “Sites with images” feature, that will be the only way they look at search results when searching for products, real estate property, homes and anything for they may hope to see a photo with the results. It will be the first filter applied to real estate searches. The bottom line is — you need quality photos to compete on the web. Now I know some of you are saying to yourself, yeah, yeah I’ve heard you say that before. Well, there is a reason I preach quality photos. Website visitors like photos, and they LOVE quality photos. Now, I am not telling you to go out and buy the newest, digital camera with a dozen or more megapixels. I won’t get started on the “Megapixel Myth.” I’ll just let David Pogue tell/show you about it in this short video on the Megapixel Myth. What sets great photos apart from those seen on many websites is photo composition and lighting. Of course, having camera with a good optical lens, sensor and circuitry, not to mention knowing how to use the camera settings, all factor into shooting really great photos. It is not enough to buy a good camera. You need to learn how to use your camera, and how to shoot great photos. 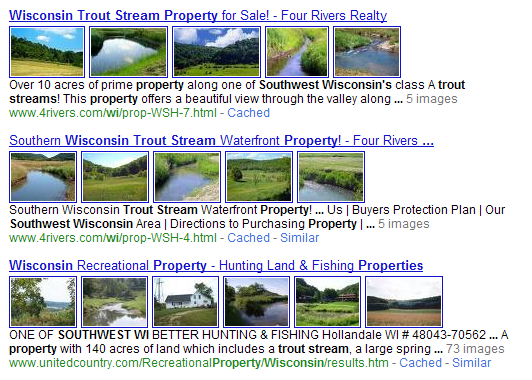 Here is an example of what was displayed when I searched for “southwest wi trout stream property.” (sans quotes) Google will display photos that are on the page visitors will see if they click. Great photos will make them click. If you don’t have, or are not willing to spend, the time to learn, then you need to hire the best professional photographer your budget allows. Before hiring them ask to see examples of photos they have taken that are similar to what you need for your website. Whether it is your time or your professional’s time it will be some of the best time you can spend. It will reap benefits in the form of more visitors to your website, more page views, and visits of longer time on your site. The quick and real summary: Professional quality photos will help you more than ever when searchers use Google’s Search Options “Sites with images” feature. 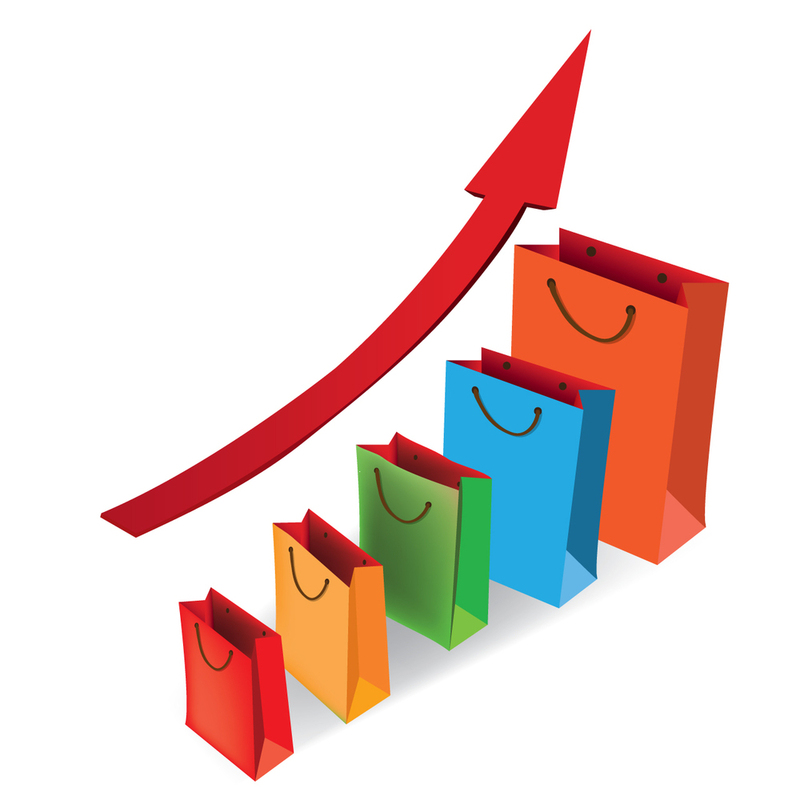 Is your community Web site Economic Development friendly? Last night I had the opportunity to give a brief talk to the GCEDC – Grant County (Wisconsin) Economic Development Corporation monthly meeting in downtown Livingston, WI. I gave them a checklist to help them make sure their community web sites are Economic Development friendly. As you may suspect, this checklist can be applied to community and economic development sites anywhere. In fact, many of the items should be implemented on every web site. Obviously, we talked in more detail about most of the items. Is Economic Development prominently displayed in the navigation? Do you have text on the home page about Economic Development in your community? Specifically a paragraph with search terms that Economic Development professionals, business owners, job seekers, and relocating workers would use to find information. Are there links in that text that take visitors to the appropriate pages on your site? Is ALL of the information current? Have two people proofread your information for errors and accuracy? Do your Economic Development pages have the appropriate Title and META Description words? Do you have contact information on every page (in the footer) that interested parties will have in front of them after they print ANY of your pages? Do you have a Google (or other mapping service) Map/Directions page? Have you tried searching Google using the terms you believe prospects would use to find a community such as yours, when searching to locate a new/existing business, or for personally relocating? If so, how did you do? Quick tips that will get you results. Every point of contact with a customer or prospect is an opportunity to provide better customer service, and to plant the seeds for a sale. Your Thank You pages should confer your thanks, but it also can offer customers and visitors to your site something they may not have noticed, and that may be of interest to them. Those types of pages are better than nothing, but they are missed opportunities. So, here are some tips for empowering your Thank You pages. Be sure to prominently display your Toll-Free phone number. If you don’t have a Toll-Free number, you are not serious about wanting customers. Have a link to the Customer Account login page. Display the special of the day, week, or month. Have links to your Shipping & Returns pages. Make sure your Thank You page has <meta name=”robots” content=”noindex”> in the header, so you don’t mess up your analytics. The only time anyone should see your Thank You page is after they place an order or fill out another form. Use Adwords conversion tracking on your Thank You page. If you are not using Google AdWords, you should be. If you don’t offer online shopping, you likely have a Contact, Request Info, or Sign Up form. Here are some tips for you. Make the words Thank You bigger than the other text. While you are at it, tell them you appreciate the time they gave you. Prominently display an email address they can use if they want to contact you later instead of having to use your form again. Display and have a link to a daily, weekly, or monthly feature or News (RSS) Feed. Make sure your Thank You page has <meta name=”robots” content=”noindex”> in the header, so you don’t mess up your analytics. The only time anyone should see your Thank You page is after they fill out a form. If you are using Google AdWords, use conversion tracking on your Thank You page. Use as few or as many of these tips that are appropriate for your site. As with any page, I am not suggesting a bunch of clutter. Use some thought as to positioning, layout and use of white space. Turn that Thank You page into a customer service and sales opportunity! Please add your own tips or thoughts by leaving a comment.